Kuwait, 8 November 2018: APM Terminals Bahrain, the exclusive operator of Bahrain’s Khalifa Bin Salman Port (KBSP), has announced the initial public offering (IPO) of 18,000,000 of its shares. The IPO, which will offer 20% of the company’s total issued share capital, is now open to Bahraini and non-Bahraini corporate and individual investors, starting November 8th, 2018. “We are excited about the IPO and look forward with confidence to our next stage of growth for APM Terminals Bahrain as a publicly listed company,” he added further. 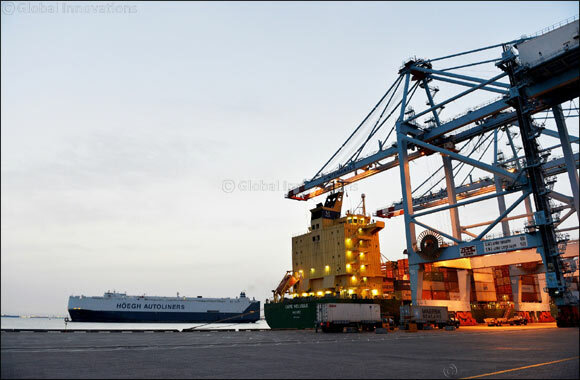 APM Terminals Bahrain is a joint-venture between Netherlands-based APM Terminals International BV (80%) and YBA Kanoo Holdings of Bahrain (20%), a leading diversified regional business group. The company which operates a global network of 74 operating ports and terminal facilities and over 117 Inland Services operations spread over 58 countries, is part of the A.P Moller – Maersk group, a global business headquartered in Copenhagen, Denmark, with activities in the transport and logistics which includes the biggest container ship operator in the world. APM Terminals Bahrain has been successfully driving forward the operations of Kingdom’s only commercial port, KBSP since 2009. Over the past nine years, the company has contributed towards positioning KBSP as a hub with its world-class operations and logistical solutions, serving both the country and the wider region, in line with the Kingdom’s Economic Vision 2030. The offer shares are priced at BHD 0.660 per share, equating to a price-to-earnings (P/E) ratio of 5.7x 2017’s net earnings of BHD 10.4 million. The IPO stands to raise BHD 11,880,000, in what is the first IPO for a transport and logistics company in the Kingdom to list on the Bahrain Bourse. The APM Terminals Bahrain IPO offering will commence on November 8th and will be open for a period of 17 days until November 24th during which potential investors can submit their applications. The prospectus of APM Terminals Bahrain’s IPO is electronically available on the websites of Bahrain Bourse (www.bahrainbourse.com) and the Company (www.apmterminals.com/bahrainIPO) as well as SICO (www.sicobank.com). IPO Application forms and printed copies of the prospectus can be collected from the ten approved branches of Ahli United Bank B.S.C. (AUB) in Bahrain, in Manama, Seef Mall (Muharraq), Gudaibiya, Riffa, Sitra, Budaiya, Hamad Town, Isa Town Mall, Exhibition road, Mercado Mall (Saar); as well as from Bahrain Bourse and APM Terminals Bahrain. Furthermore, clients of the brokerage units of any of SICO BSC(c), AUB, Global Investment House BSC or BBK BSC can also apply for shares through their brokers. Shares will subsequently be allotted on November 29th. The IPO is structured with 70% of the shares on offer allocated to institutional investors (i.e., those applying for over 100,000 shares) while 30% of the shares have been allocated to retail investors (i.e., those applying for up to 100,000 shares). Immediately following the IPO, on December 9th, the company’s shares will be listed and will commence trading on the Bahrain Bourse under the ticker symbol APMTB. All applicants that have been allocated shares in the IPO are then eligible to trade by opening an account with a Bahrain Bourse registered brokerage if they do not already have one. Furthermore, applicants allotted shares in the IPO will be eligible to any dividends distributed by the company for the full year ended 31 December 2018. The company has also appointed SICO to provide price stabilization and market making services from the start of trading on the Bahrain Bourse. SICO is the mandated lead manager, underwriter and market maker, while AUB has been appointed as the receiving bank with ten of its branches across Bahrain registered for the IPO offer, along with two additional receiving desks at Bahrain Bourse and APM Terminals Bahrain during the offer period. Bahrain Bourse is the Listing Exchange for the company and Trowers & Hamlins and Hassan Radhi & Associates are the legal advisors. KPMG Fakhro are the financial due diligence advisor and auditor to APM Terminals Bahrain; while Bahrain Clear are the allotment agent for the IPO and share registrar for the company.